At any stage of any given process whether it be mining, wood shops, grain facilities, sawmills, or paper facilities, dust is produced. Many of these dust types pose health and fire hazards if they are not controlled effectively. With over 20 years of experience and a large selection of dust collectors let us put your mind at ease. Reverse air baghouses are the best choice for applications requiring high efficiency performance, and are often used in the primary and secondary wood industries. These dust collectors are modular in design, with a dedicated reverse air fan to clean the bags in each compartment. This allows effective online cleaning, and significant energy savings over compressed air. Another benefit of not using compressed air solenoids means these baghouses can be used in extremely cold climates. Pulse-jet baghouses are used in many applications, including the wood, grain, and chemical industries. They have a small footprint and are less expensive than other baghouse styles. 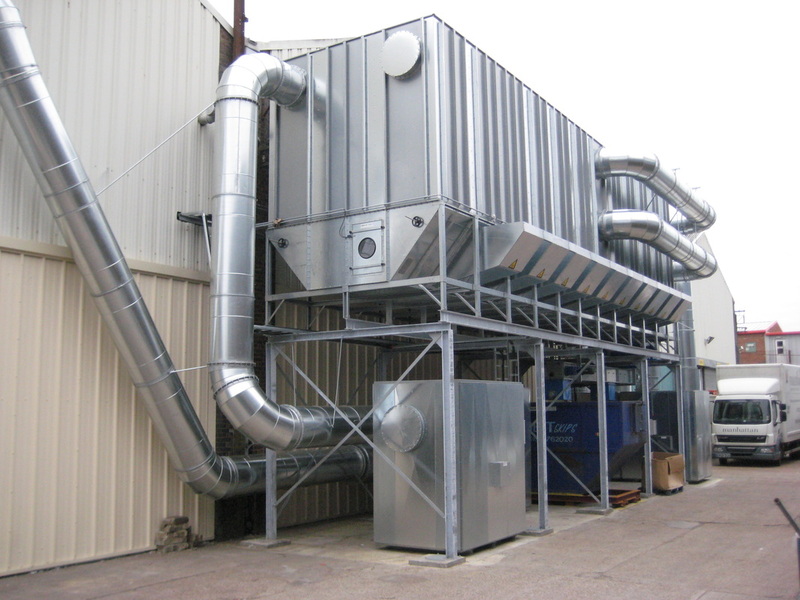 An indoor dust collector provides filtration for small shops or an existing dust systems that are incapable of handling new equipment, such as secondary wood applications or educational facilities. These units are quiet and economical as they are small and are easy to install. They can be located inside buildings and are exempt from some fire/ safety regulations. 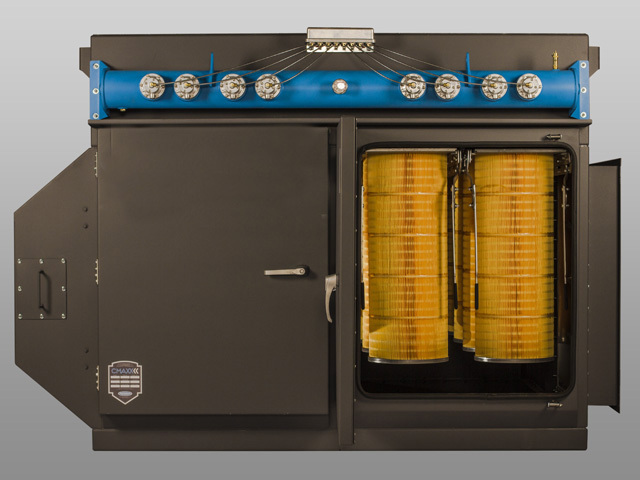 These unique cartridge filters are used in fine dust and fume applications such as welding, food or pharmaceuticals. 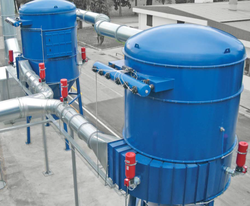 The vertical filter design provides superior cleaning performance by eliminating dust build up on the filters, which results in increased cleaning efficiency, low internal velocity and long filter life. The design provides quick and easy filter changes resulting in very little downtime. 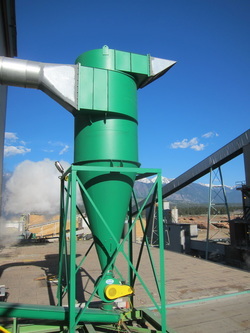 Cyclones are used in a wide variety of applications as product receivers, pre-cleaners/separators to high efficiency fabric-type dust collectors or as independent collectors for coarse dusts. The simplicity and durable nature of the cyclone's design means that they can be used in high temperature and abrasive processes. An advantage to the cyclone collectors is the low capital investment and maintenance costs needed due to no moving parts and robust construction. Airmax supplies options such as abrasive wear liners and high-efficiency cyclones. Ambient filtration is used in wood, paper and other fine dust industries where direct capture is difficult or impossible. 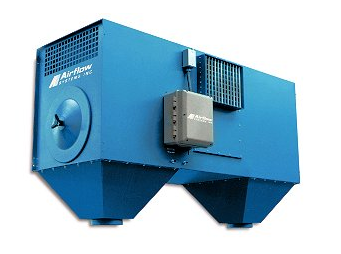 These units are efficient and can be configured to create circular air patterns that help minimize airborne particulate.